Mid-week market update: On Monday, the major market averages successfully tested their 50 day moving averages (dma) and bounced. Does this mean that the correction is over? Not so fast. There are several indications that the market still has unresolved business on the downside for Monday's test to be a durable bottom. First of all the SPX remains in a short-term downtrend, and the breach of that downtrend line is the first test of this rally. It's difficult to have a detailed opinion on the pros and cons of this fund. That's because the article only described what this "index fund" would hold, it did not describe the portfolio construction method, or how much of each stock it would hold. So it`s impossible to understand the risk profile of the fund, the size of its factor exposures, as well as its sector and industry exposures. All the marketing hype aside, this investing approach is really a re-packaged form of factor investing, otherwise known as "smart beta". Therefore investors who buy into such a vehicle should expect similar kinds of results as "smart beta", though in a multi-factor format. Could "animal spirits" rescue the Trump rally? My inner trader uses the trading component of the Trend Model to look for changes in the direction of the main Trend Model signal. A bullish Trend Model signal that gets less bullish is a trading "sell" signal. Conversely, a bearish Trend Model signal that gets less bearish is a trading "buy" signal. The history of actual out-of-sample (not backtested) signals of the trading model are shown by the arrows in the chart below. Past trading of the trading model has shown turnover rates of about 200% per month. Update schedule: I generally update model readings on my site on weekends and tweet mid-week observations at @humblestudent. Subscribers will also receive email notices of any changes in my trading portfolio. Well, that shift in tone came out of nowhere! 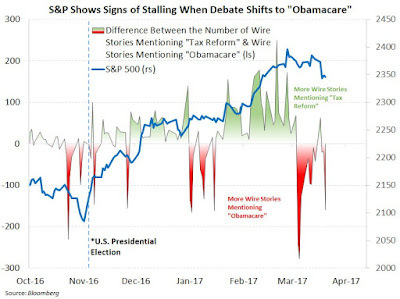 It seems that as the focus shifted from "tax cuts" to "Obamacare", the stock market began to lose steam and retreated. Before the bulls get overly discouraged, Main Street's enthusiasm for the Trump agenda may spur enough growth to keep the Trump rally going. 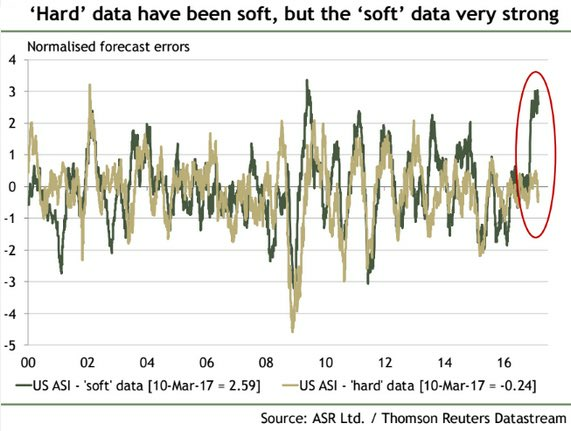 Megan Greene recently highlighted this now familiar chart of the large gap between soft (expectations) and hard (reported) data. I had also raised the same question just after Inauguration Day (see Could "animal spirits" spark a market blow-off? Mid-week market update: Regular readers will know that I have been tactically cautious on the market for several weeks, but can the blogosphere please stop now with details of how many days it has been without a 1% decline? The market fell -1.2% on Tuesday with no obvious catalyst. Despite today's weak rally attempt, Urban Carmel pointed out that the market normally sees downside follow-through after 1% declines after calm periods. Within that context, I offer the following three approaches to spotting a possible market bottom, with no preconceived notions about either the length or depth of the correction. I was reviewing RRG charts on the weekend (click here for a primer on RRG charting) using different dimensions to slice and dice the market. When I analyzed the regional and country leadership, I was surprised to see that the dominant leadership were all China related (note that these ETFs are all denominated in USD, which accounts for currency effects). From a global and inter-market perspective, this is bullish for the global reflation trade. As expected, the FOMC delivered a rate hike last week, From the bond market`s perspective, you would have thought that the Fed cut rates. The stock market rallied, and bond yields fell. From the viewpoint of some of the pundits, I thought that the Apocalypse was at hand. David Rosenberg warned that "There have been 13 Fed rate hike cycles in the post-WWII era, and 10 landed the economy in recession". Not to be outdone, Bill Gross said that "Our highly levered financial system is like a truckload of nitro-glycerin on a bumpy road". What's going on? Who is right, the bond market, or the pundits? I hope that you are enjoying the stock market rally this week. My inner trader covered his short positions last week and stepped aside to await a better short re-entry point. St. Patrick's Day may be it. 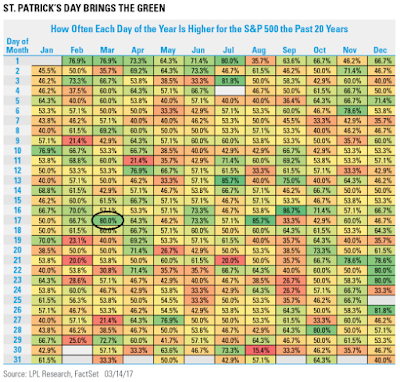 Ryan Detrick pointed out that St. Patrick's Day is one of the most positive days of the year, though as of the time of this writing, the market has been flat. As well, Rob Hanna at Quantifiable Edges highlighted March option expiry week (OpEx) is one of the most consistently bullish OpEx weeks of the year. 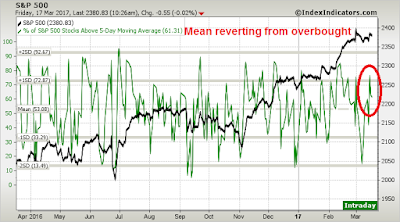 As I will show later, OpEx+1 week tends to mean revert and see market weakness. 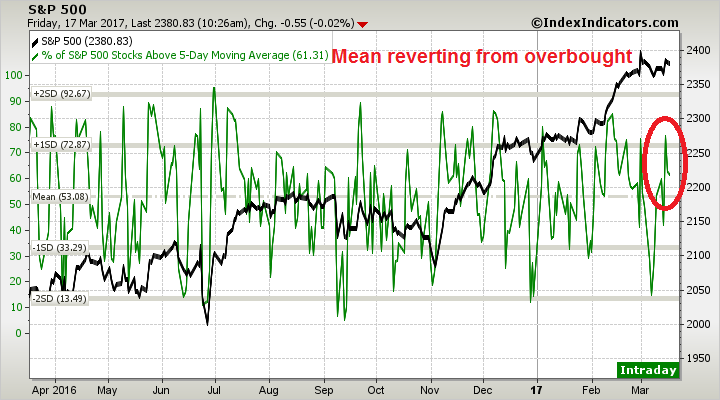 The latest readings from Index Indicators show that the market is rolling over after flashing a short-term overbought reading. 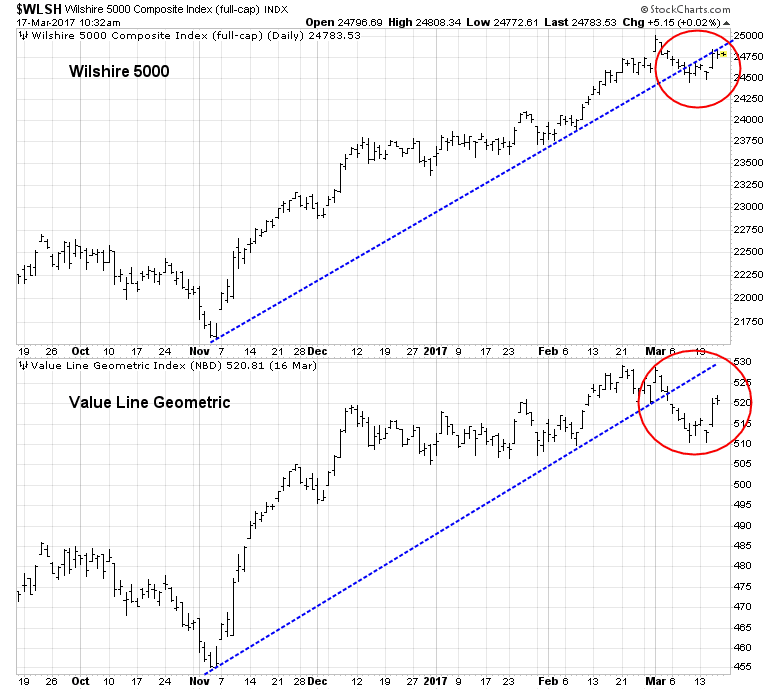 In addition, a number of broad based indices had violated their uptrends, which is setting up the market up for a period of correction or consolidation. Risk appetite, as measured by the junk bond market, is flashing a minor negative divergence. When I put these conditions together with my own study of OpEx week, it adds up to a tactical sell signal on the stock market. Mid-week market update: It was no surprise that the Fed raised rates, as they had spent the last month widely telegraphing their intentions. This morning's release of February CPI tells the story. 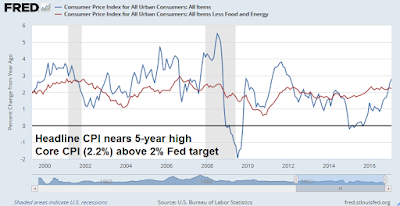 Headline CPI is near a 5-year high. 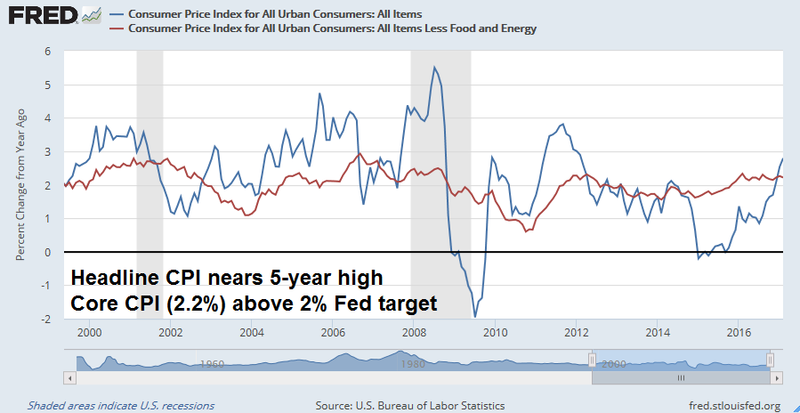 Though core CPI (ex-food and energy) edged down, the latest reading of 2.2% is above the Fed's 2% targeted inflation rate. 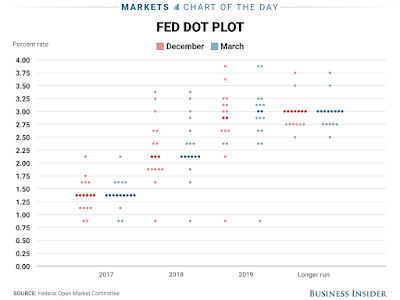 The big surprise was the dot plot, which the market anticipated would edge upwards. Instead it remained mostly unchanged for 2017, though rate expectations were nudged up for next year. Similar to Zweig's Fed policy indicator and in line with the desire to measure when the Federal Reserve is tightening credit, Edson Gould, a legendary technical analyst from the 1930s through the 1970s, developed a simple rule about Federal Reserve policy that has an excellent record of foretelling a stock market decline. The rules states that "whenever the Federal Reserve raises either the federal funds target rate, margin requirements, or reserve requirements three consecutive times without a decline, the stock market is likely to suffer a substantial, perhaps serious, setback" (Schade, 2004). This simple rule is still relevants. Although it tends to lead a market top, it is something that should not be disregarded. Here are the bull and bear cases under "three steps and a stumble". In particular, the current economic cycle is elongated and shallow compared to past recoveries, and therefore it would be premature to worry about Fed actions to cool down the economy just yet. As the market awaits the FOMC decision and statement this week, there are a number of other critical market moving events to watch for. The Trump White House is expected to release its "skinny budget" this week, which may contain some broad outlines of the tax reform package. In addition, Angela Merkel's White House visit Tuesday could bring important news on the trade front. Donald Trump came into office promising a series of tax cuts and offshore cash repatriation incentives for Wall Street. But tax cuts have to be offset with either revenue increases or spending cuts. Trump adviser Gary Cohn recently stated on CNBC that the White House is aiming for to be revenue-neutral over a 10-year period. 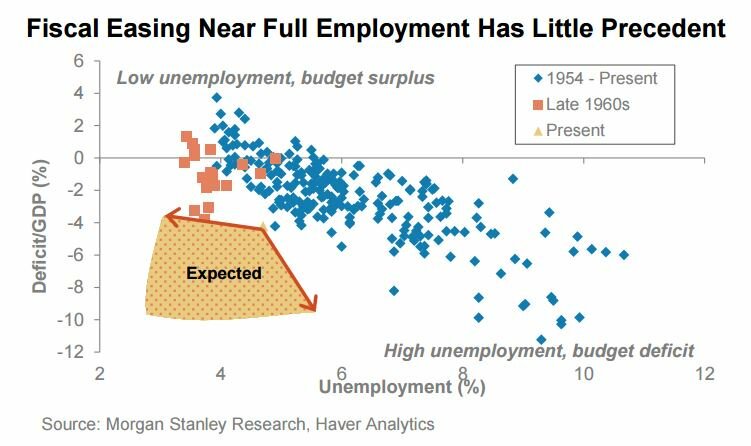 As this chart from Morgan Stanley shows, this level of fiscal stimulus is highly unusual at this point of the economic expansion. The main strategy for paying for the many of the proposed tax cuts is the imposition of a Border Adjustment Tax (BAT), which will penalize imports while encouraging exports. The BAT proposal, however, is likely to run into a number of major objections from America's largest trading partners. Those objections have come from Canada, which is America's biggest customer, and from Germany, the sixth largest (chart via CNN Money). A levy on goods imported to the U.S. would damage business on both sides of the northern border and could impede the growth of energy, automobile and steel industries that benefit from bilateral cooperation, Trudeau said at a press conference in Houston. German chancellor Merkel is expected to be far less diplomatic than Trudeau. 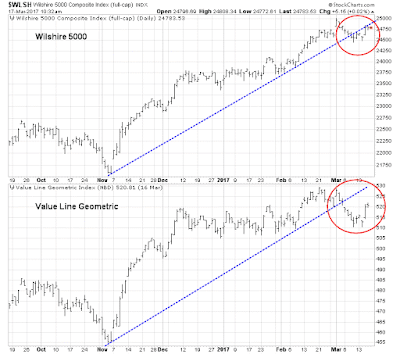 Last week, I wrote about signs of stretched stock market valuation (see Why I am cautious on the market). 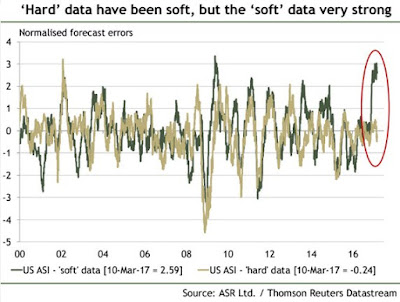 Last Wednesday, I warned about excessively bullish sentiment, which suggests that stock prices are likely to pull back (see A sentimental warning for bulls and bears). Despite these red flags, I would caution that both valuation and sentiment models are notoriously bad at timing market tops. Expensive markets can get more expensive, and stock prices don`t necessarily go down if investors get into a crowded long. These models serve the highlight the risks to a market. Here is another take on valuation. Taking a very long term 30-year view, Urban Carmel observed that the SPX goes up and down in fits and starts after adjusting for inflation. The key to achieving superior long-term returns is to buy when valuations are low, which is not the case today. 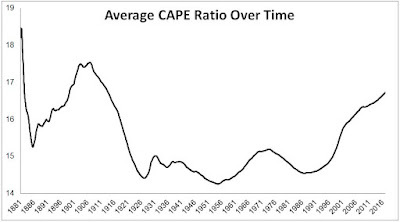 Michael Batnick at Irrelevant Investor showed that the Cyclically Adjusted PE ratio (CAPE) is elevated when compared to its own history. 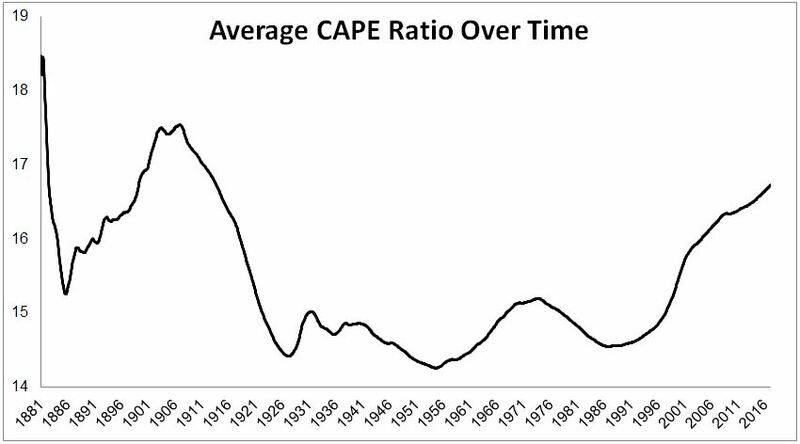 But average CAPE has been rising over time. If valuation doesn't work for short term market timing, what should investors do? 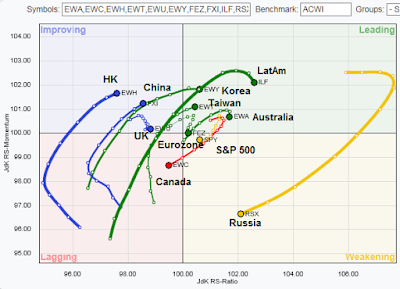 In the intermediate term, a focus on fundamental and macro momentum in addition to factors like valuation and sentiment. Current conditions can more useful for market timing. Using this framework, it suggests that risks are rising, but there is no need to panic just yet. The market is looking toppy, but this is not "the top". These giddy sentiment readings are comforting to the bear camp (chart via Business Insider) and it will be difficult for stock prices to advance under such conditions. When everyone is bullish, who is left to buy? However, I would warn the bears that they should not go overboard and short the market with both hands. 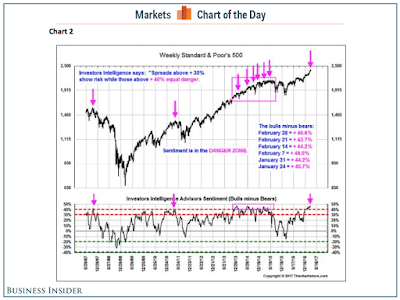 In the past, euphoric sentiment has not a good indicator for pinpointing market tops. I have had a number of subscribers ask me to extend the chart of my longer term calls, which had only gone back two years. The chart below shows the highlights of my posts back to 2013, which are intended for investors with a 6-24 month time horizon. I haven't been always right. On occasion, I was early, late, or simply mistaken. Here is the links to the past posts shown in the above chart. In addition, these are the buy and sell calls of the trading model, which are designed for traders with a 1-2 week time horizon. Again, I haven't been always right. The most recent failure occurred when the trading model got caught long (and wrong) in the correction in late 2015. This week’s Sentiment Survey special question asked AAII members what factors are most influencing their six-month outlook for stocks. Nearly three-quarters of respondents (73%) cited national politics, particularly President Donald Trump’s polices and what actions Congress may take. Tax reform was mentioned by many (20% of respondents), followed by regulatory reform and uncertainty over what legislation will actually be passed. Just under 23% of all respondents listed the ongoing rally and the prevailing stock valuations, with several of these respondents expressing concerns about the level of valuations or that a drop could be forthcoming. Monetary policy was cited by 8% of all respondents, followed by corporate earnings growth (7%) and investor sentiment (7%). Some respondents listed more than one factor. Any changes in the path of fiscal or trade policy have the potential to create further market volatility. The economy appears to be at a transition. We are closing in on full employment, inflation is moving gradually toward our target, foreign growth is on more solid footing, and risks to the outlook are as close to balanced as they have been in some time. Assuming continued progress, it will likely be appropriate soon to remove additional accommodation, continuing on a gradual path. To conclude, recent developments suggest that the macro economy may be at a transition. With full employment within reach, signs of progress on our inflation mandate, and a favorable shift in the balance of risks at home and abroad, it will likely be appropriate for the Committee to continue gradually removing monetary accommodation. As the federal funds rate continues to move higher toward its expected longer-run level, a transition in balance sheet policy will also be warranted. These transitions in the economy and monetary policy are positive reflections of the fact that the economy is gradually drawing closer to our policy goals. How the Committee should adjust the size and composition of the balance sheet to accomplish its goals and what level the balance sheet should be in normal times are important subjects that I look forward to discussing with my colleagues. When a dove like Brainard sounds this hawkish, there is little doubt about whether the Fed will raise rates at its March meeting. What about Buffett's bullish comments? "We are not in a bubble territory" in the stock market, he said on "Squawk Box." If rates were to spike, however, then the stock market would be more expensive, he added. It looks like the Fed is about to raise start a rate hike cycle. So what now? Mid-week market update: Boy, was I wrong. Two weeks ago, I wrote Why the SP 500 won't get to 2400 (in this rally). Despite today's market strength, stock prices may be restrained by a case of round number-itis as the Dow crosses the 21,000 mark and the SPX tests the 2,400 level. 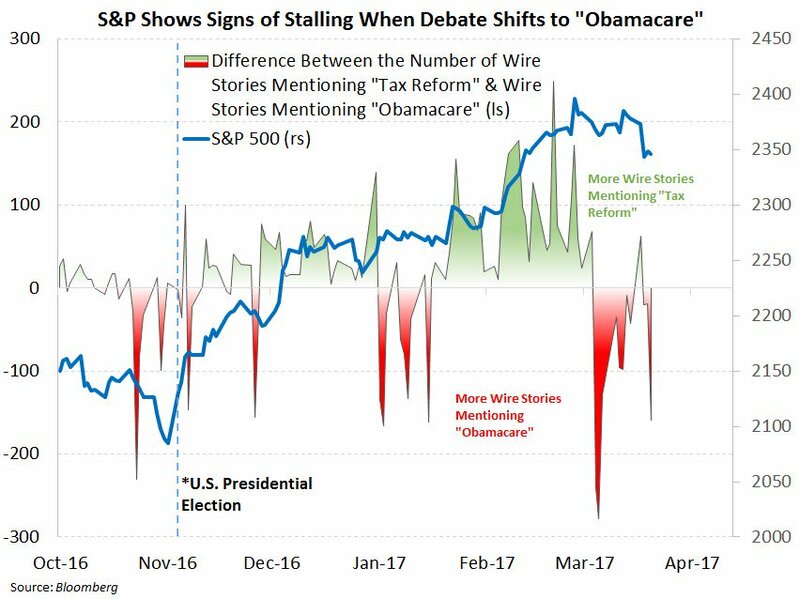 In addition, the market's reaction to President Trump's speech to Congress was at odds to the reaction from Street strategists. While the market went full risk-on in the wake of the Trump speech, this Bloomberg summary of strategist comments made it clear that the speech was long on themes and short on details. Perhaps stocks are rallying because Trump did not go off script and sounded statesmanlike and presidential. How long the market remains patient with his lack of the specifics on tax reform, which is Wall Street's major focus, remains an open question. In the meantime, the SPX has broken above its trend line and appears to be staging an upside blow-off. When animal spirits start to stampede like this, you never know when the rally will end. 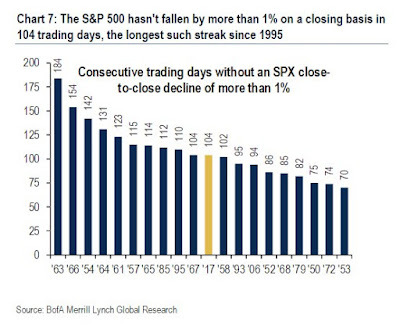 Does this mean it's time to jump back on the bullish bandwagon? Not so fast. The week isn't over and there are a couple of other major developments (other than the Trump speech) that warrant consideration.